Lee Byung-yoon (Hangul: 이병윤; born June 15, 1993), better known by his stage name BewhY (Hangul: 비와이), is a South Korean rapper and member of '$exy $treet & Yello Music crew'. Initially he chose 'BY' as a stage name, but changed it to 'BewhY' to give a meaning to the name. He won first place on Show Me the Money 5 in 2016. Rapper C Jamm is his old friend from high school and Bewhy is also well known for devout Christianity. ^ "비와이 프로필" (in Korean). Naver. ^ "'쇼미더머니5' 비와이 "빅뱅 지드래곤 보고 이름 지어"". Diodeo. ^ "Watch: "Show Me The Money 5" Final Winner And Performances Revealed". Soompi. ^ "Korean Rapper 'BewhY': 'All of This Is Not Mine but His Story'". CHRISTIANITY DAILY. ^ a b "Gaon Album Chart". Gaon Music Chart. Archived from the original on 2015-08-27. ^ "2017년 09월 Album Chart". ^ "Gaon Digital Chart". Gaon Music Chart. Archived from the original on 2017-03-09. ^ a b "2016년 Download Chart". ^ a b c "2016년 Download Chart". ^ a b "2016년 07월 Download Chart". ^ "2017년 05월 Download Chart". ^ "2017년 24주차 Download Chart". ^ "2017년 25주차 Download Chart". ^ "2017년 36주차 Download Chart". ^ "2017년 38주차 Download Chart". ^ "2016년 40주차 Download Chart". ^ "2017년 11주차 Download Chart". ^ "BewhY tries acting for the first time in 'Suits'". Kpop Herald. May 4, 2018. ^ "Winners at the 6th Gaon Chart Music Awards". Manila Bulletin. ^ "KMA2017: Nominees for 14th Korean Music Awards". ^ "KMA2017: 14th Korean Music Awards Winners". ^ "The Winners Of The 2016 Melon Music Awards". Soompi. ^ "All The Winners Of The 2016 Mnet Asian Music Awards (MAMA)". Soompi. ^ "2017 Korean Hip Hop Awards - Nominees List". koreanhiphopawards.com. Archived from the original on 27 January 2017. Retrieved 27 January 2017. ^ "2017 Korean Hip Hop Awards - Winners". Korean Hip Hop Awards. Retrieved 2017-02-28. 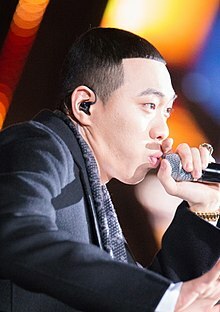 Wikimedia Commons has media related to BewhY. This page was last edited on 3 February 2019, at 03:13 (UTC).